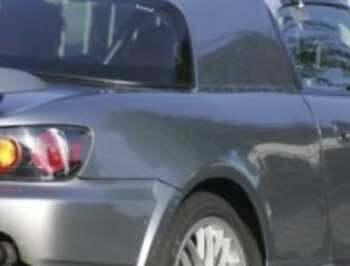 Spy Photos: Honda NSX Mule? According to spies, Honda engineers are holed up in a workshop along the Nürburgring. Inside, they're apparently attending to a bizarre test mule built from an S2000 roadster. Though basically stock looking, a curious set of panels have been tacked on for length and width, the passenger compartment appears larger, and a case of elephantiasis appears have affected its hoodline. Thus, the shooters surmise the underlying structure could belong to Honda's next NSX supercar, which many had been expected to be based on the Advanced Sports Car Concept (below). The latest loose talk indicated Honda execs were unsatisfied with the path of development, and sent design engineers back to the CAD workstation to make some major tweaks. Notwithstanding the dichotomy of a front-engined NSX, this car will likely show up early next decade, wearing a $150,000 sticker. Over The Back Fence: Acura NSX Going Back To The Drawing Board?